As new self-storage developments continue to emerge across the U.S., those looking for opportunities for self-storage investment turn to market data that can provide them with insights as to where these opportunities exist. One example of such valuable key market data is pricing volatility. Pricing volatility is an indicator of how aggressive or passive a market is with its unit rates. Markets or stores with higher pricing volatility will have frequent rate or inventory changes, whether it’s a raise or decrease in the rates or adding and/or removing units advertised online. Higher pricing volatility is usually an indicator of coordinated strategies usually in the form of dynamic pricing. 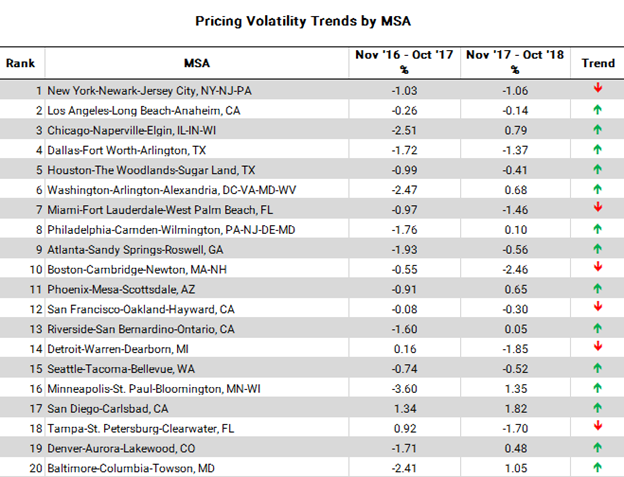 In this article, we look into the changes in pricing volatility in the top 20 MSAs in the U.S over the last two years. Specifically, we compare pricing volatility for two periods in the last two years, November 2016 through October 2017 and November 2017 through October 2018. We calculated how the monthly pricing volatility has trended each month and took the overall average for each of the two periods. Below is a comparison of how average monthly pricing volatility is trending (upwards or downwards) during both of these periods. 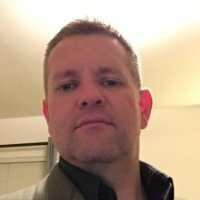 This pricing volatility covers pricing changes across all unit types. In this year-to-year comparison, 6 of the 20 MSAs saw a downward trend in pricing volatility while the rest of the MSAs saw an upward trend in the last year. The largest trend increase was in Chicago, Washington D.C., Philadelphia, Minneapolis, Denver and Baltimore MSAs. This means these six MSAs are seeing an uptick in pricing activity in their markets – more stores are changing rates more frequently and/or adding or removing inventory online. Owners and operators wanting to keep or increase market share, need a strategic approach to pricing and be able to quickly react to any changes in the market. StorTrack can provide store or unit-specific pricing volatility for any market in the U.S. For more information, contact our team.